My wife Erin — the most important person in my world — is feeling somber again. It’s late 2011. We’ve been trying to have a child for a year now. It hasn’t happened yet. We’ve progressed past keeping track of her cycle on a calendar. We’ve learned about basal body temperatures and Erin has just started using ovulation prediction kits. Erin has taken more of an interest in the goings on inside of her body than she has ever had to in the past. She doesn’t want to, but she has to. She has to if we’re ever going to be able to have a baby. We haven’t sought out professional help or anything, but we know it’s taken us longer than it “should”. Something just isn’t right. We’re at dinner with dear friends of ours that we’re visiting. They don’t know we’ve been trying to have a baby. They’re incredibly excited to share their news with us. But unbeknownst to them, Erin and I just had that knife in our hearts turn another 30º. The wound immediately gets reopened. This is easily the hundredth time I’ve told this joke. I’m not sure if it was ever particularly funny. I know for sure that I don’t find it funny anymore. I’ve just been asked “When are you two having kids?”. Again. I know the person asking is trying to be nice, and trying to make conversation. Well, unless it’s a family member. Then they really are asking and really want to know why we’re being selfish and taking so long. I use the joke because it’s disarming, and it forces me to smile. I’m scared if I tell the truth, I won’t be able to smile very much at all. Again, with friends. Again, they have no idea we’ve been trying over a year now. These particular friends got married in March of 2011. We had already been trying for months before they even got married. We were at their wedding. Not too long later, they’re pregnant. How is this fair? We’ve been trying since they were planning their wedding, yet they’re able to conceive so easily. It just doesn’t add up. Erin is putting on the happy face. She’s doing an amazing job. It’s a little easier because she is happy. We’re very excited for our friends. They can’t tell she’s dying inside. No one can tell. Except me. I can tell. It’s late spring of 2013. Erin and I have been trying for two and a half years now. We’ve flirted with the idea of seeing a fertility specialist, but I knew Erin needed to come around to it in her own time. It seems like she has. It’s a huge step for us, as it’s an explicit admission that we can’t do this on our own. That we need help. Life seems to happen in stages. As someone who has had a Facebook account since 2004, I’ve seen it. All of my friends got married (we were one of the first). All of my friends got pregnant. All of my friends had kids. We started on the marriage bandwagon before nearly anyone. Erin was a couple months shy of 24 and I was 25. Yet here it is we’re on a treadmill, and can’t progress forward. At this point we’ve been married 6 years. I stop looking at Facebook daily, like I used to. I rarely look at it anymore. I just can’t stand it; every other post is about someone’s baby. I’m happy for them… I really am. But I can’t see the constant reminder of how we’re falling short. Of how we can’t seem to conceive. Erin and I have just left our fertility doctor’s office. Since the actions we’ve taken thus far haven’t really stuck, it’s time to start discussing more invasive alternatives. In our case, that means in vitro fertilization. We talked to our doctor about this for around an hour. It’s worse than we expect in every way. It’s harder on Erin in terms of time spent, pills taken, procedures she’d have to go through. It’s harder on both of us in terms of a financial burden. Our choices basically amount to driving a used car off a cliff every month, or driving a shiny new car off a cliff once. It’s something we’ve had to prepare for, and we’ve been saving for a while now, but it’s still hard to swallow. Now having the facts, we talk it over. Simultaneously we curse our poor luck and dysfunctional bodies and yet at the same time we give tremendous thanks that modern science gives us the option of doing IVF at all. We worry about the potential for twins, triplets, or more. While our doctor is very cautious when it comes to “multiples”, it’s still something to worry about. A lot to consider. As with seeing the fertility doctor in the first place, I think it will take time for both of us to come around to this idea. We may never actually do so. Erin and I woke up early, for no particular reason. She has just come back from the restroom, and she looks white as a ghost. It’s March 3. Just a day or two before, we were discussing whether or not we want to take the leap of starting our first round of IVF treatments. Erin shows me the pregnancy test. It’s one of the ones that says the words, rather than having easy-to-misconstrue lines. Clear as day, there it is: Pregnant. We’ve been with our fertility doctor for nine months now. That irony isn’t lost on us. We’ve been getting help, and seeing him each and every month to assist in the conception process. Somehow, by some miracle, it finally worked. Erin and I are beyond ecstatic to announce that she is pregnant!! We’re so extremely thankful, and so unbelievably lucky. We’ve taken a long road to get here. At times, we weren’t sure if we would ever get this far. We’re scared to death of what the future brings. We’re scared to find out if we’ll be good parents. We’re scared that Sprout may not end up healthy, despite every test so far saying he or she is. Despite that, we’re overjoyed. We’ve conceived. We’re having a baby. We’ve worked hard at this. Some of it was practice, but a lot of it was work. Even before meeting 🌱, it’s already so amazingly worth it. 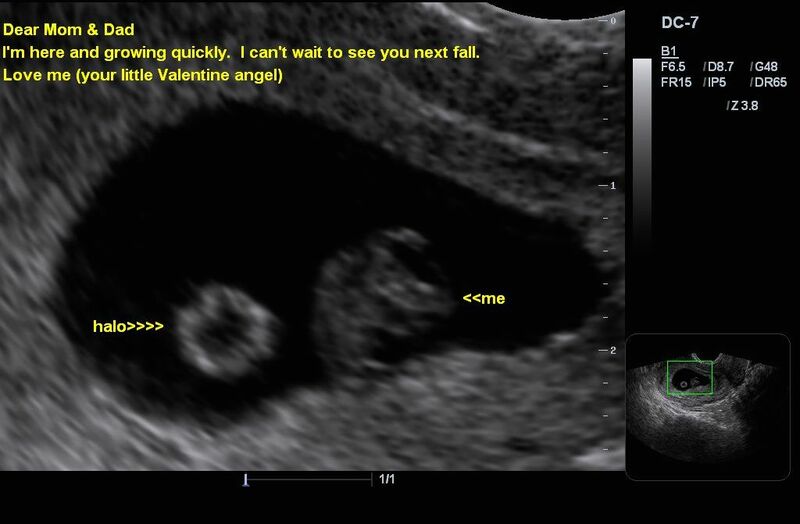 When we got our first ultrasound, and were able to hear a fast little heartbeat, it was all worth it. Four years after this journey began, barring any unforeseen complication, it will finally end. We will finally get to meet our Sprout. Our little bundle of pure, unadulterated joy. We’re so excited, we can barely think or talk about anything else.